With its gloomy, mournful face it’s easy to incorrectly conclude that the Basset Hound is a bore. While no one can describe the typical Basset Hound temperament as “electric,” they are a rather tolerant and friendly addition to any family. 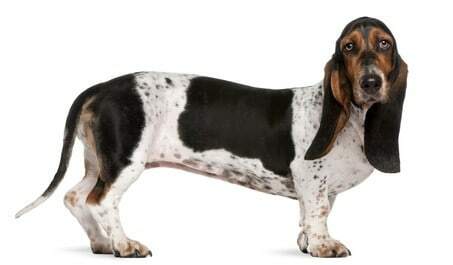 The modern-day Basset Hound probably originated through controlled breeding in the late 1800s, though some sources trace it even further back to the 1500s. However, mummified remains suggest that similar short-legged hunting dogs existed for millennia before that. The word “Basset”, which, in French, means “rather short,” describes a key characteristic of the Basset Hound: dwarfism. While his average height is just over a foot at the shoulder, it may be a surprise to some that the typical Basset Hound weighs in at a fairly hefty 55 to 60 pounds! Getting to know your Basset Hounds Temperament traits and its behavior is the best thing you can do help you decide what to expect from this breed. Don't too caught up in his looks. Once you get past this shorty's big adorable eyes and ears its all about temperament and personality. The Basset Hound is very safe around small children. This is because it is quite difficult to aggravate the Basset Hound. Rather than react aggressively to unwanted attention, they are more than likely to just move to a more sheltered spot. It takes a lot to upset the Basset Hound. Because Basset Hounds are pack dogs, they are not territorial. Instead, they are rather tolerant and sociable. Bassets do very well with other pets and so are particularly comfortable in a large family. And, while they may alert you with a bark to someone outside the front door, they are more likely to greet the stranger calmly once you open the door, rather than like an intruder. Basset Hounds once hunted in packs and, to this day, they are still happy to be “one among many.” This is true for dogs, cats, people – whoever! It is rare for the Basset Hound to take issue with anyone or anything. The drawback, however, is that the Basset Hound temperament demands company. They do not typically do well if left alone for long periods. Not only that, but a bored, lonely Basset Hound can let out one of the most unique howls you have ever heard. Everyone on your block will know he's alone…and for how long. For all his measured responses, if an interesting smell floats by this scent hound’s nostrils — a scent hound whose olfactory abilities are second only to the Bloodhound — your buddy will be off like a flash, leaving everything else in his wake. If you do not leash him when you're out for a walk with him, you will regret it. Don't let him run off after a scent. You never know where that scent could take him – possibly even into the street or away from home for good. Basset Hounds have impressive endurance, which they normally exhibit when an exotic scent wafts past them. Otherwise, they are quite content to “go with the flow” of things. If you are active, they will be happy to accompany you. If you’d rather sit at home and relax for the day, they are down with that idea. One thing's for sure: they're less likely to get into a frenzy like their Border Collie siblings. You should take him for daily walks to keep him healthy and to prevent him from becoming overweight. Bassets do great at dog parks, as they love to be part of a dog pack just as much as a human one. Maybe he acts measured because his short legs once required him to compensate in order to be an effective hunting dog. Nevertheless, don’t expect briskness and cheerful readiness from a Basset Hound. On a good day, you will get a measured, seemingly thoughtful, response. On a bad day, however, he can be downright stubborn. Some have suggested that this aspect of the Basset Hound temperament is reflective of his poor intelligence. However, the truth, as any Basset owner can confirm, is that while he is extremely intelligent, he has days when he can be just plain stubborn, too. Though, it’s impossible to be angry with him for it – just one look at that hangdog face and you'll melt like ice cream in the sun. 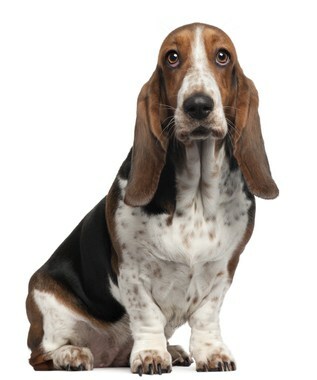 The Basset Hound as we know him today descended from French dogs created in the late 1800s in the U.K. The earliest evidence of these short-legged hunting dogs come from the Middle Kingdom of Egypt. Archaeologists have discovered carvings of the dog's image, along with mummified remains of the dogs, in the Dog Catacombs located in Saqqara. Ancient Greeks and Romans both used Scent Hounds for hunting purposes. As mentioned earlier Bassets can be “independent” (another word for stubborn). So training one of them can be a challenge, to say the least. 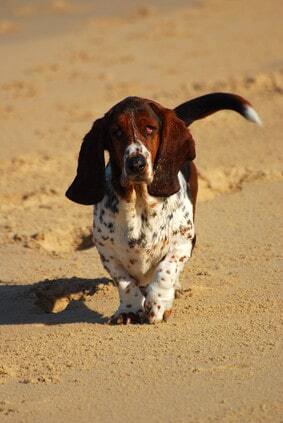 Bassets have it in their blood to hunt out on their own, able to follow a scent without succumbing to distraction. Therefore, if he's onto something, and you're trying to grab his attention, he may completely ignore you. All hope is not lost, however – while it may seem impossible, you can actually train a Basset Hound. You just need to want and be able to put in the time and persistence necessary to do it. As with almost every dog, early socialization with other dogs and people is crucial if you want him to grow up to be a well-adjusted, mature adult dog. For help with training your Havanese dog take a look at The Online Dog Trainer by Doggy Dan. Doggy Dan is an expert Dog Trainer based in New Zealand. His online resource contains Hundreds of Excellent Dog Training Videos that will take you step-by-step through the process of developing a healthy, happy well-behaved dog. Bassets' ears do well with regular cleaning, as do the folds of skin around the head area. As for their coats, Bassets shed more than you might think for a smooth-haired dog. You can manage his sometimes copious shedding by brushing him at least once a week. Trim his nails regularly to keep walking comfortable, and give him the occasional bath when his coat is looking not-so-shiny. 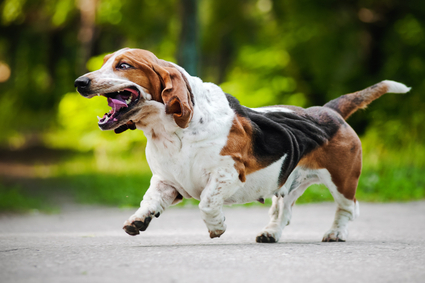 Like most other breeds, the Basset Hound has his own brand of idiosyncratic health issues. Typical of other breeds who also suffer from dwarfism (like the Dachshund) are back and joint problems, as well as intervertebral disk disease. The Basset's loose skin makes him somewhat susceptible to skin problems, and his large ears make him vulnerable to ear infections. The life expectancy of a Basset Hound is between 10 and 12 years. Are you willing to take on the tenacious Basset Hound temperament and bring a Basset puppy into your family? That's great! You can find a Basset Hound for sale either from a Basset Hound breeder or through a rescue or adoption agency. The average Basset Hound price is between $300 and $500. This is pretty affordable, as far as puppies go. And, of course, the price changes depending on the breeder and the dog's history. If you are interested in adopting a Basset Hound puppy, look no further than your local animal shelter. Of course, they may not have a Basset Hound ready to adopt on the day you check, but keep checking back for when the new “stock” comes in. And, if all else fails, you can always opt for one of those adorable Basset Hound mixes mentioned earlier. There are several upsides to adopting a dog. For one thing, you don’t have to worry about housebreaking a puppy if you adopt a dog from a shelter. This is because either his former owner already trained him or the shelter did to make him more appealing for adoption. Another upside is that you can give a dog a home that might not otherwise find one. Plenty of dogs spend years in the shelter, constantly passed over in favor of the younger, prettier dogs. Some dogs never find a warm, loving home at all. Buying a dog from a breeder is also an option you may want to consider. There are upsides to buying a dog from a breeder, too. If the breeder is reputable – and you shouldn’t be shopping with one who isn’t – he or she will be available for the dog’s entire life to answer any questions. Next, if you’re interested in showing a dog, buying a dog from a breeder is often the only way to find a purebred dog who is of show dog quality. For this reason, puppies from breeders are more expensive than dogs you can adopt from the shelter. Always investigate the breeder before you complete the transaction. Look up the breeder’s credentials online, and thoroughly inspect the dogs’ environment. Make sure the dogs have plenty of space to roam around and play, and that the environment they’re living in is not dirty or unsafe. Conclusion: Why the Basset Hound? The affectionate Basset Hound temperament makes him a truly enjoyable dog. He's a very go-with-the-flow kind of dog. He doesn't have any problems with anyone, so you can have him around other dogs, cats and children. His only real issue is that he can be rather stubborn at times. But as long as you're persistent with him, he will come around. You can also use treats as a reward, but not too many. The Basset Hound is low to moderate energy, so it is more likely he won't burn off those treats as fast as, say, a Husky might. And remember to keep his ears clean during the grooming process. Droopy ears can hide moisture and dirt and, if left untreated, he can develop some pretty nasty infections. Previous post: Collie Temperament – What Made Lassie So Smart?